Marquette, MI – February 17, 2017 – Sunny.FM is bringing you the 27th Annual UP200. 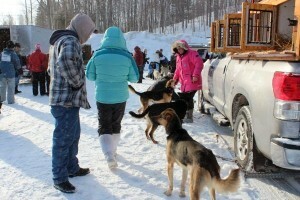 Teams from Michigan, Minnesota, Canada, and even Iowa, are competing this year in the UP 200, an Iditarod qualifier. Celebrate the start of both races in Downtown Marquette. Listen in at 101.9 or online at Sunny.FM for interviews throughout the day with mushers, local representatives and more! Around noon you can join the Public Service Garage state for the Midnight Run Chili Feed. Until 2 PM, Public Service Garage will be serving up Chili from Wendy’s. More events open to the public will be running all day leading up to the races. At 5 PM stop by the Marquette Children’s Museum where you can enjoy a pizza party and meet Scratch! Also starting at 5 PM, enjoy treats at Gophers Bakery, refreshments at Marquette Yoga Center or refreshments at Michigan Fair. Most events are on Washington Street, why not hit them all? One team getting ready for vet check! Join The Eagle Mine Information Center Staff for refreshments at 6:30 PM or drop in to the Marquette Commons for the Warming Party! In the Commons you’ll find snacks and beverages. Just down the road the Marquette Welcome Center Viewing Party will also be kicking off at 6:30 PM. Watch the teams go by as the mushers depart while snacking on pizza, cookies, hot chocolate, coffee and more. Looking to do something a little later one? The Masonic Building Race Night Party starts at 6:30 PM and runs until 11 PM! Drop by to jam out to live music, enjoy indoor viewing of the races, food, beverages, a chance to get out the History of the Race room and purchase UP200 merch. You might even get to meet at few dogs as Seamus and Scratch are scheduled to make an appearance. The Opening Ceremony for the 27th Anniversary of the UP200 starts at 6:30 PM with the start of the race beginning at 7:00 PM in front of The Mining Journal. The Midnight Run is set to start 30 minutes after the last team leaves for the UP200. Start time for the Midnight Run is estimated to be around 8:30 PM. If you can’t make it out to the race, consider checking in on the teams with this year’s live tracking. Some the UP200 merch for sale.